The Tuxedo Farms project encompasses approximately 1,200 acres of land located in the Town of Tuxedo, Orange County, New York. 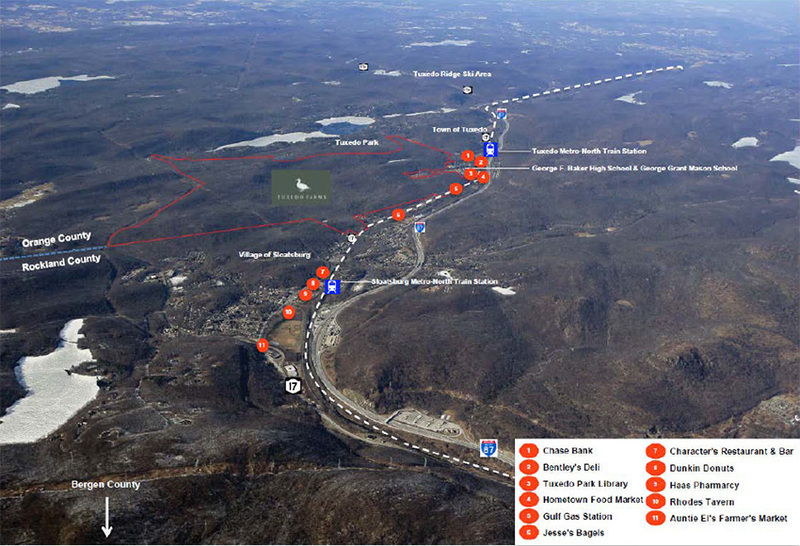 The project is located 35 miles from Manhattan and benefits greatly from a broad array of transportation options including the Tuxedo Metro-North train, which is approximately one mile from the development and offers direct access to New York’s Penn Station, bus and highway commuter access, major interstate access such as I-87 and I-287, and air transportation including Westchester Airport and Newark International Airport. 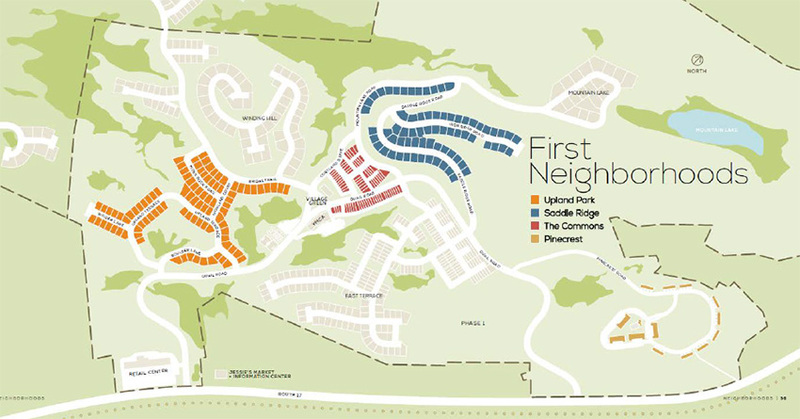 Upon completion, the project is expected to deliver a master planned community comprised of approximately 1,195 homes and up to 100,000 square feet of commercial and amenity space. The project is anticipated to be developed over three phases with Phase I total investment of approximately $164.4 million. Construction of Phase I began in 2015 and is projected to include up-front infrastructure completion, 716 residential units and the majority of the project’s amenities such as a YMCA, retail town center, parks and trail systems, and coordination of shuttle services between transit systems. Phase I is anticipated to be completed by the end of 2018 with future phases of remaining residential to immediately follow. The existing site of the Tuxedo Farms project is undeveloped consisting of wooded and rugged hills, rock ledges, streams, and a lake. As a result, the project will require significant efforts to provide the necessary site work and infrastructure needed for the residential and commercial development. The Town of Tuxedo is responsible for providing most governmental services to the Town residents and will further service the Tuxedo Farms project. Fire protection, refuse and sewer services are provided by various special districts in the Town. Pursuant to the State Environmental Quality Review Act, the Town undertook a review process of the proposed development and regulations consistent with the Act. Following this review, and resulting from deficiencies in the Town’s existing waste water treatment plant, the Town issued a special permit to the Developer allowing development to proceed while also imposing certain conditions and restrictions on the development to provide the Town with certain sewerage facilities. The Town subsequently established the Farms Sewer District, the Tuxedo Farms Local Development Corporation (the “Corporation”), and authorized the delivery of a Sewer Construction and Funding Agreement and Sewer Services Agreement for the purpose of levying special assessments on the Farms Sewer District to pay for the costs of providing the sewerage facilities. The Corporation was established for the purpose of assisting in the financing, construction, acquisition and operation of the sewerage facilities. Furthermore, the Town approved the incorporation of a SW Corp, wholly owned by the developer, for the purpose of operating and maintaining the waste water treatment plan in accordance with the Sewer Services Agreement. In June 2015, the Corporation issued bonds in the amount of $30,000,000 as a private offering. Additional bonds are not currently contemplated. 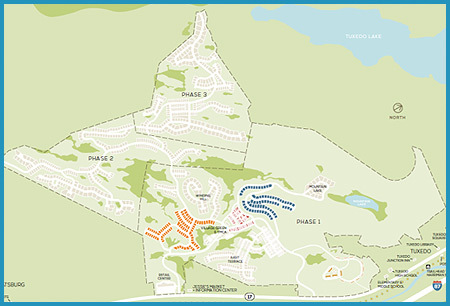 The proceeds of the bonds will be used to finance public infrastructure improvements consisting of certain sewer system improvements, including a sewer treatment plant that will provide sewer service to both the Tuxedo Farms Sewer District and existing sewer district of the Town known as the Hamlet of Tuxedo Sewer District. Security for the bonds includes a pledge of Service Fees by the Town to the Corporation. The Service Fees shall be paid, subject to annual appropriation, from the special assessments levied on the Tuxedo Farms Sewer District and Hamlet Sewer District with only the Tuxedo Farms Sewer District responsible for service fees related to debt service on the 2015 bonds. Services fees will be collected to pay for debt service on the bonds, administrative expenses related to the bonds, operating and maintenance costs, and certain sewer operation accounts pursuant to the Sewer Services Agreement. Special assessment financing functioned as a redevelopment tool, facilitating the redevelopment of underutilized land in a strategic location. Furthermore, the special assessment financing provided for the construction of a sewer system that will enable the Town to lift a moratorium on the issuance of new building permits within the Hamlet District due to the currently failing sewer facilities. Remaining costs of the necessary infrastructure and private development is expected to be paid from a combination of equity and land sales revenues. Prior to the issuance of bonds, MuniCap, Inc. served as financial advisor to the developer. Furthermore, MuniCap, Inc. assisted in the development of the special assessment methodology, which is the first use of this type of financing in the State of New York, for the purpose of repaying the bonds. Once the bonds were issued, MuniCap, Inc. transitioned into the role of administrator for the Corporation. As administrator, MuniCap, Inc. reviews requisitions, prepares continuing disclosure reports, updates the annual budgets, monitors IRS compliance, and determines the application of special assessment methodology.